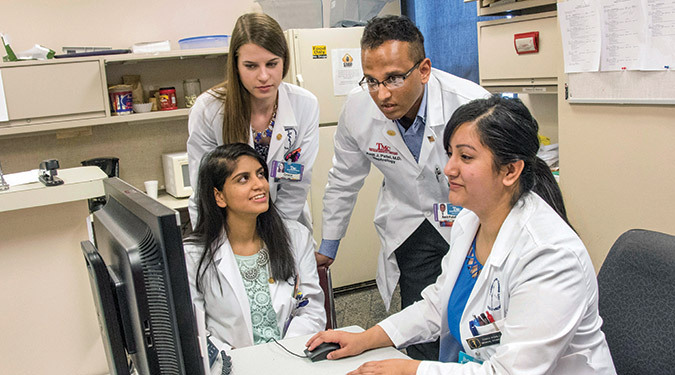 The requirements for admission are governed by the School of Medicine Council on Selection, the admissions committee for the School of Medicine. The Council on Selection is composed of faculty, administration and students who screen applications, determine which candidates will be offered an interview and make all final admission decisions. Admission decisions are based on an individualized and holistic review of applications. Applicants offered admission to the B.A./M.D. program begin coursework in August. The average unweighted high school GPA for a student admitted to the B.A./M.D. program is 3.89. The range of unweighted high school GPA for students admitted between fall 2010 and fall 2018 years is 3.0 – 4.0. Applicants for admission to the B.A./M.D. program must be fully admissible to the University of Missouri – Kansas City. Admission to UMKC is determined by a combination of ACT score, class rank and the completion of the 17 core requirements of the university. Applicants for admission to the B.A./M.D. program must achieve an unweighted GPA of 3.0 in the 17 core requirements of the university. Applicants not admitted to UMKC or applicants offered trial admission are not eligible for admission to the B.A./M.D. program. The average ACT score for a student admitted to the B.A./M.D. program is a 32 (SAT 1420). Missouri residents are required to submit an ACT score. Regional and out-of-state residents may submit an ACT score or an SAT score; however, an ACT score is preferred. The Council on Selection will review the best composite score. Students applying to the B.A./M.D. program must have taken the ACT and/or SAT for the first time by the November 1 deadline. The latest test score accepted for initial application review is the October test date. October test scores are considered as “on time” for admissions consideration. If a student is selected for an interview, the latest test score accepted for final review is the December test date. ACT and SAT scores must have been earned within three years of the application deadline of the year in which the student is applying. SAT subject exams are not used in the admissions process. There is no single component of the application that will guarantee a candidate an interview or an offer of admission. Demonstrate a commitment to the strongest academic curriculum offered in high school. Advanced Placement, International Baccalaureate, college credit, honors and/or other college preparatory courses are recommended. Demonstrate leadership ability and involvement throughout the entire high school experience, including involvement with high school activities and organizations, community service, employment and other opportunities available within the school. Demonstrate an early commitment and interest in medicine through continuous involvement in health-related activities, including volunteer experiences, shadowing a physician and/or other health care provider, medical clubs and organizations, medically-related camps, and other health related experiences. Students should demonstrate the initiative to investigate the profession beyond what they may experience from parents who work in health care or other activities such as lifeguarding, babysitting, or working the school blood drive. Must graduate from a high school or home school program in the United States or from a U.S.-accredited high school. Must be U.S. citizens or permanent residents. Permanent resident status must be achieved by November 1 of the year before the fall term for which student is applying. A copy of the permanent resident card must accompany the general application for admission. International students are not eligible for admission to the B.A./M.D. program. Students with 24 hours or less of post high school graduation college credit at the time of application are eligible to apply for admission to the six-year B.A./M.D. program. If the applicant is currently enrolled in college in the semester in which they apply to the six-year program, the number of college credit hours accumulated at the end of that semester must not exceed the 24-hour credit limit. While the application is being processed, applicants may continue taking college courses during the next semester. It is recommended, but not required, that current college students enroll in at least 15 hours each semester and enroll in science coursework. Current college students interested in applying to the six-year program must have earned a cumulative GPA of 3.0 at the end of the fall semester (first semester of college). Students who do not earn a cumulative GPA of 3.0 at the end of the fall semester are ineligible for admission to the program. College transcripts with fall semester grades must be received before the Council on Selection can review the application. Offers to interview will not be made until an official college transcript with fall semester grades has been received. Current college students must meet all other admissions requirements and eligibility outlined above. If you have questions about your residency status, please contact the General Admissions Office at 816-235-8652.